Today’s flick is Brian Yuzna’s unwarranted 1998 sequel to The Dentist, The Dentist 2. The Dentist 2 is, of course, a sequel to 1996’s The Dentist, which was written by the duo of Stuart Gordon and Dennis Paoli (Dagon, Castle Freak, Re-Animator, From Beyond), and then extensively re-written by Charles Finch, one of the producers of Fat Slags. While Dentist 2 gives character credits to all three of those writers, the screenplay was written by one Richard Dana Smith, who had no previous credits at the time. He would go on to write a handful of TV movies, such as The Perfect Neighbor and The Stepdaughter, but not much else. 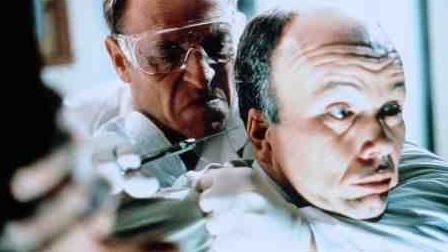 The Dentist 2 was directed by Brian Yuzna, who also directed The Dentist, Bride of Re-Animator, and Beyond Re-Animator. He is also a long-time producer and collaborator with Stuart Gordon on such movies as Dagon, From Beyond, Dolls, and Re-Animator. The cinematographer for The Dentist 2 was Jurgen Baum, who also shot such films as Sorority House Massacre II and Jim Wynorski’s Hard To Die. 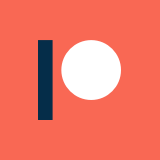 The editor for the film was Christopher Roth, who also cut such films as The Dentist, Leprechaun, Killer Klowns From Outer Space, Raptor Island, Hatchet, and Axe Giant: The Wrath of Paul Bunyan. The producers on The Dentist 2 included Mark Amin (Evolver, Leprechaun, Leprechaun 3, The Dentist, Chairman of the Board), Noel Zanitsch (Wishmaster, The Dentist), Robert Lansing Parker (The Running Man, The Dentist, Night Shift), Bruce David Eisen (Evolver, Trucks, Leprechaun 3, Leprechaun In The Hood), Pierre David (Videodrome, Scanners), and the film’s star, Corbin Bernsen. The visual effects crew for The Dentist 2 was made up of Michele Pruden (Soccer Dog), Rita Schrag (King of the Ants, Poolhall Junkies, Puppet Master 4), and Jim Stewart (Beeper, Scorcher, Dr. Alien, Chopping Mall, School Spirit). The makeup and special effects team for The Dentist 2 included Anthony Ferrante (who later directed the Sharknado franchise), Sam Greenmun (Evil Eyes, The Dentist, Virtuosity, Mystery Men), A.J. Venuto (Blade, Transformers, AI), Ralis Kahn (Pledge This!, Kiss Kiss Bang Bang, Dogma), and J.M. Logan (Texas Chainsaw Massacre: The Next Generation, Halloweentown, Virus, G-Men From Hell). The music for The Dentist 2 was provided by Alan Howarth, an experienced composer and sound editor with credits on such movies as The Omega Code, They Live, Escape From New York, The Dentist, Halloween III, Battle Beyond The Stars, Poltergeist, Fortress, The Running Man, Class of 1999, Total Recall, Cool as Ice, and Tank Girl. The cast for The Dentist 2 is once again led by Corbin Bernsen (The Dentist, Judgment, Psych), with accessory roles filled out by Clint Howard (Blubberella, House of the Dead, Santa With Muscles, Ice Cream Man, Night Shift), Jeff Doucette (The Mangler 2, Newhart, Splash), Jim Antonio (Catch Me If You Can, Crazy In Alabama), Wendy Robie (Twin Peaks, The Glimmer Man), and Susanne Wright (The Brothers Solomon), among many others. The plot of The Dentist 2 takes place after the events of The Dentist, where Dr. Feinstone finds a way out of his mental hospital and goes on the run. He takes up in a new town under a new name, and is looking to start another practice. However, he has tried to overcome his dark past, and has to wrestle with his inner demons and compulsions while also evading the authorities who continue to hunt him down. The full title was originally The Dentist 2: Brace Yourself, a title that is still used on some of the home video box covers. However, the movie is typically just known as The Dentist 2. Reportedly, a third installment in the series was planned (and even greenlit), but Brian Yuzna wasn’t able to find the time to make it before Trimark merged with Lionsgate in 2000, which likely means there will be no more Dentist movies in the future. The reception to The Dentist 2 was overwhelmingly negative. It currently holds a rating of 4.2 on IMDb, along with Rotten Tomatoes scores of 0% (critics) and 24% (audience). The film had an estimated budget of $1.8 million, but never had a chance to earn any of that back in theaters, ultimately going straight to video. 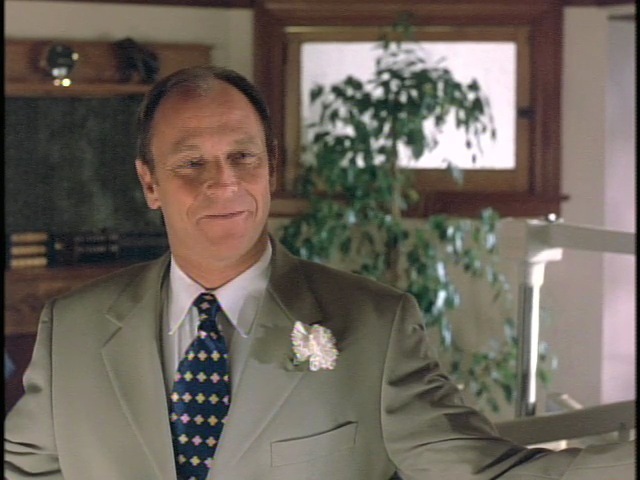 Corbin Bernsen is as hammy as ever in this film, and is an absolute delight to watch. However, not a whole lot happens in this movie, making it a pretty disappointing sequel to an astoundingly cheesy movie. A lot of the conflict is internal for Feinstone, and once he does give in to his impulses, he isn’t quite as theatrical as he was in the previous movie, as he doesn’t really have the same motivations for his actions. There also isn’t nearly as colorful of a cast of character behind him, like Ken Foree’s cop from the first film. Overall, there is still some stuff to enjoy in this film for fans of the first movie, particularly in regards to Bernsen’s acting, the nauseating cinematography, and the score. However, there isn’t nearly as much action or tension in this sequel to keep the plot interesting, which makes the movie feel anchored down. Fans of the first should check it out, but it hardly compares to the ridiculous glory of The Dentist.